Do you require alcohol-free preserved Flower Essences? As a Special Order we are able to preserve your Essences primarily in alcohol-free vegetable glycerine if required (Flower Essences are traditionally preserved in Brandy). ​Glycerine is a sweet-tasting, vegetarian and natural food additive used as an alcohol-free alternative to preserve foods, herbal remedies and Flower Essences. ​Specially for you - made to order. The shelf life will be reduced to 2 years in glycerine (brandy is +7 years) and you will need to keep the bottles in a cool, dark place below 60F throughout. They contain a minute trace of alcohol. Read below for full details. Made to order therefore please allow an extra 2 working days before dispatch. ​Each stock bottle contains up to 3 drops of Mother Essence (MET) which has been traditionally preserved. 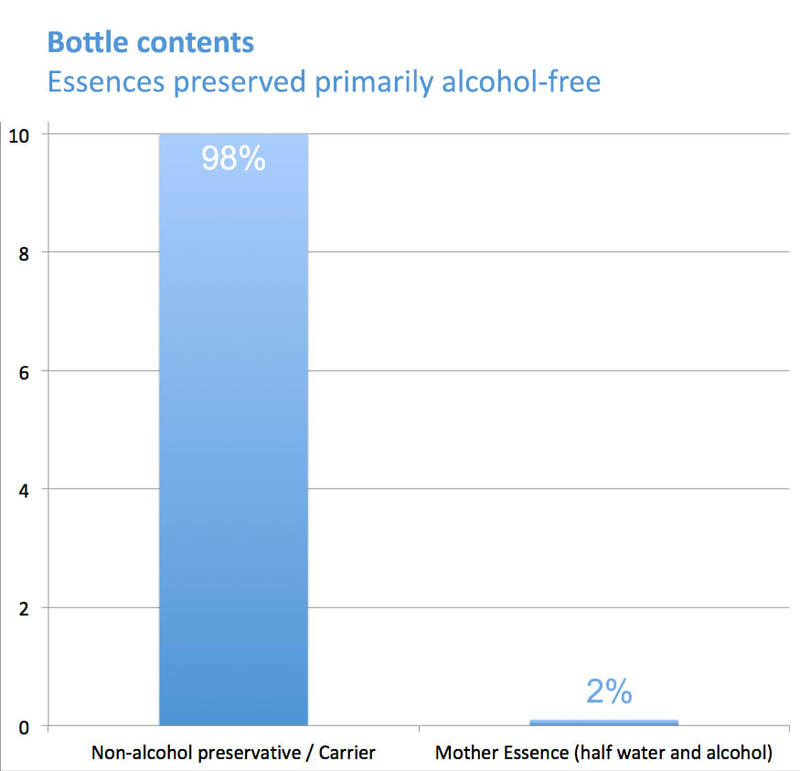 Therefore, the bottle contains a maximum of between 0.75 and 1.5 drops of brandy alcohol that has been significantly diluted in spring water and natural food-grade vegetable glycerine. Less than approximately 0.1% ABV. We offer this special service as we want to help people who want to take authentic Flower Essences that are significantly reduced in alcohol. Our Glycerine-preserved Essences are used by people who are intolerant of alcohol, recovering alcoholics and people who simply want to avoid alcohol in their diet. The alcohol content in the Essences is a minuscule amount. For example and as a comparison: significantly greater amounts than 0.1% ABV of alcohol can naturally occur in a human’s bloodstream through the process of digestion and fermentation of food. And fruit juices typically contain a naturally occurring ABV of 0.1%. Glycerine is a clear, odourless liquid with the consistency of thick syrup. Extracted from vegetable oils through hydrolysis. Pure grade made to food standard, kosher grade, non-GMO, super high quality. Add 2 drops to a small glass of water and sip. Or add drops to a dosage bottle, containing 1 half spring water and 1 half preservative (e.g. apple cider vinegar or vegetable glycerine) and take daily. See instruciotns on product label. We insist on using traditional MET (preserved in brandy) to potentise our products, because we make our Essences in the authentic way - to the 1930's instructions of Dr Edward Bach (the man who discovered Flower Essences). This means therefore that we cannot avoid our Essences containing a small trace of alcohol: the MET ingredient. ​We do not make our Essences homeopathically as this is not the way Dr Bach made Flower Essences. Homeopathy and Flower Essences have an entirely different method of manufacture - they are entirely different products. Flower Essences were a completely new and different method of healing, discovered by Dr Bach. Therefore, if you buy our traditional or our glycerine-preserved Essences you can be confident that you are using 100% authentic Bach Flower Essences. Ingredients label. Click to enlarge. Note: We use our normal labels for our glycerine preserved Bach Flower Essences. 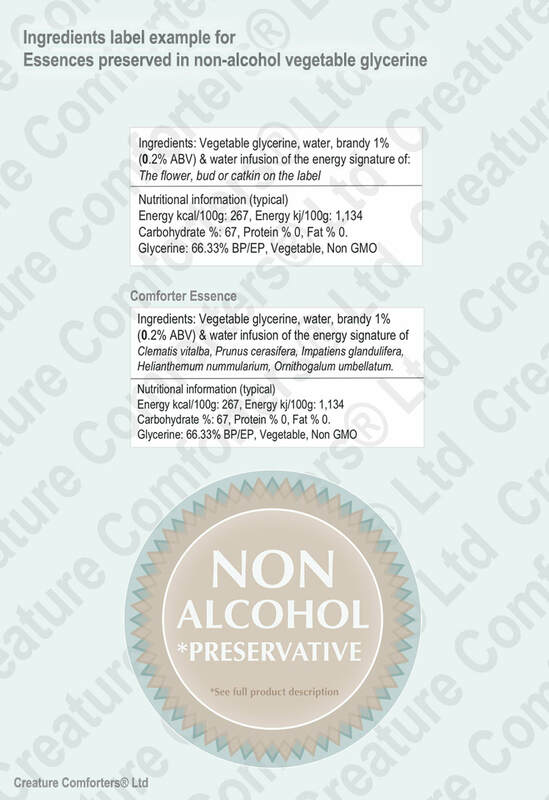 ​A small sticker is then placed over the ingredients that describes the glycerine composition. This graph shows the minute trace of alcohol in a 10ml bottle. Approximately 98% of the bottle comprises the natural non-alcohol vegetable glycerine carrier. ​The remaining 2% MET comprises one half spring water and 1 half brandy. Note the 'proof' of that minute trace of brandy is 36% (importantly it is not 100% neat alcohol) therefore the ABV in the bottle is a minuscule 0.2% ABV. ​There is more alcohol in a carton of fruit juice. 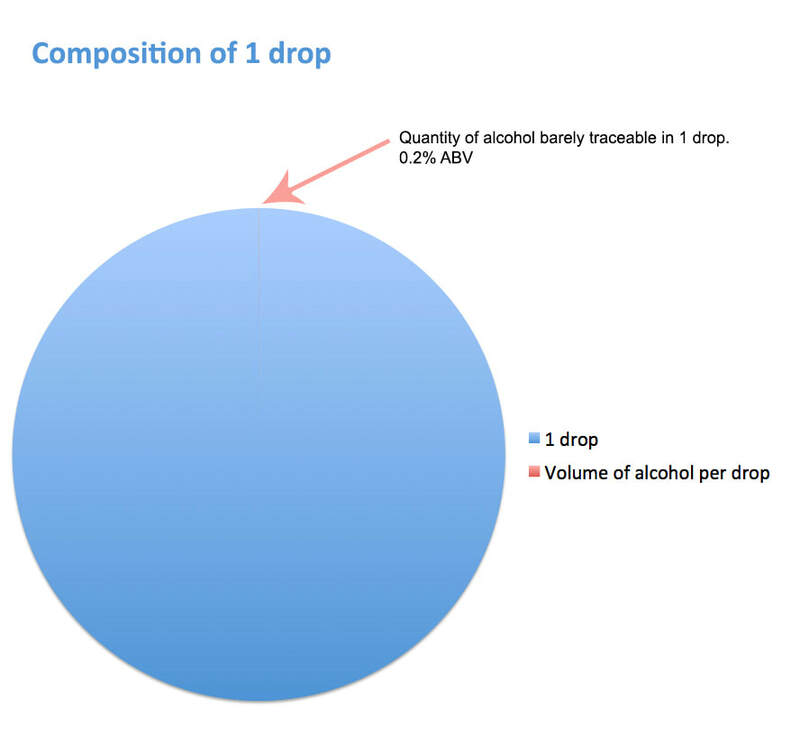 This graph shows the barely traceable amount of alcohol in 1 drop (so small that it is difficult to see on this graph). Approximately 0.002%. ​If you would like to further significantly dilute, to an infinitesimal amount, add drops to a glass of water and sip. See product label for how to use. Flower Essences are made using a similar principle to that of homeopathy. Therefore each bottle contains a specific and very small amount of Mother Essence (MET) that is used to 'potentize' the product. That MET is preserved using brandy in the traditional way (read more about MET above). Non-alcohol preserved Bach Flower complete Kit. Contains 40 stock Bach Flower Essences (preserved in glycerine), a pack of 38 divination cards, 2 large dosage bottles, 38 beautiful posters - all contained in a superb wooden case. Quality Essences made direct from the Mother Essence. ​No VAT (tax) added. WE SHIP WORLDWIDE. 'First Aid in a bottle'. Used for immediate help for any distressing, alarming, crisis or extreme situation. E.g. Emergencies, Exams, Interviews, Accidents, Stage fright etc. Stock Flower Essence, 10ml or large 30ml dropper Bottle. ​Please note that, depending on the number of Essences (MET) in the bottle, a 50ml Personalised Blend may contain up to 10 drops of brandy alcohol. Read why in the section above called Our promise of Authenticity. If you want to further dilute the small traces of alcohol please add drops to a small glass of water and sip. Please store the product in a dry and very cool place below 60F, away from direct sunlight. Avoid touching the glass part of the dropper, to ensure the Essence remains clean. See full usage instructions on product label. Glycerine is heavier in weight than water and therefore it is sold by litres (10ml, 30ml or 50ml) not by weight. 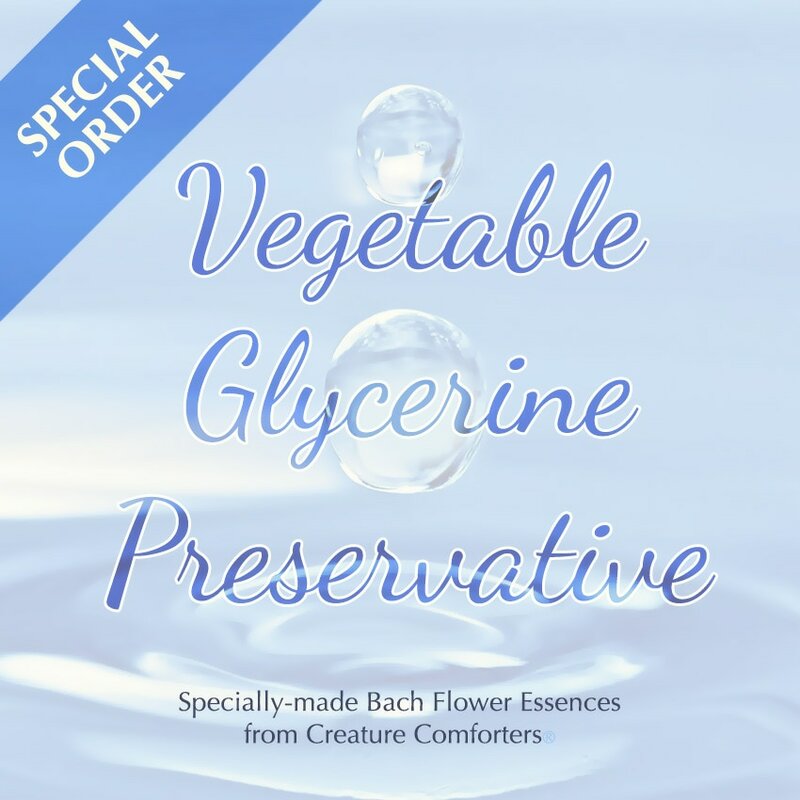 Any Bach Flower Essence product that is preserved in glycerine is a special 'Made To Order' service. Therefore please allow a couple of extra days before dispatch of your order. There is little or no actual fibre of the Flower Essence plant in the solar infused MET used in our Essences and Blends. It is the 'energy signature' of the plant - the pure 'Mother Essence Tincture' used as the active ingredient. To learn more about this, and how it works, please go to our Flower Essences Explained webpage. ​ What is Vegetable Glycerine? ​All Creature Comforters® products are made using natural ingredients. Our advice is that, if you are unsure if any product you take will affect your medical condition, you should consult your physician before taking any supplement or foodstuff to which you are unfamiliar.